There are so many directions you can go with family pictures! Bright and colorful... formal, and sophisticated... emotional and sweet... there's a lot to choose from! For indoor photography, you can choose from here at our Dubuque photography studio or even in your own home! Or perhaps outdoor family portraits is more of your style! You know your family the best, but still can't make up your mind? We'll help you find the style of family photos that fits! What you wear to your family pictures is one of the most important decisions! You want to be visually connected and part of that is to wear clothing that goes together. You can do this through similar color and style choices. Feeling overwhelmed? We'll help you through your clothing choices to help you coordinate outfits. Your family loves each other, don't be afraid to show it! Family Portraits are most meaningful and precious when they show the caring relationships your have with each other. Whether you want to show off your fun and lighthearted side or your more emotional self, preserving your relationship is important. 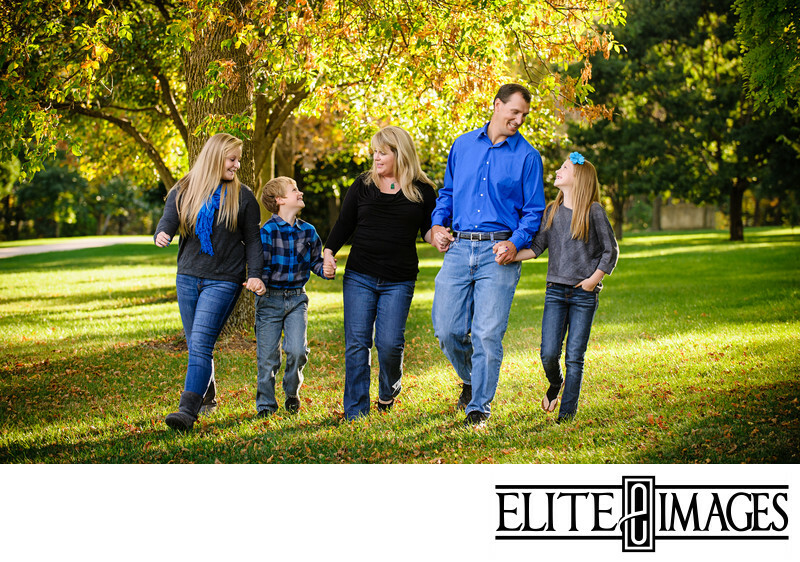 At Elite Images, we love capturing those family connections on camera so you can savor them for decades! The family photography session can be a bit overwhelming, but that's why we're here to help! Our Dubuque photographer gives you direction throughout the entire photoshoot so you know exactly where and how to stand. He composes the image as a whole and looks at each individual to make sure everyone is looking their best so you don't have to! You just have to sit back and relax. Your family is precious and beautiful and you should show off how amazing you all are together to the whole world! ...Or at least to your living room. In a digital world, it's easy for your favorite family photos to get lost in all of the social media. That's why it's so important to have physical prints to save your family's memories! Here at our Dubuque photography studio, we specialize in providing high-quality print products so you have a tangible treasure that will last for a lifetime. Whether it's wall art for your home or a little desk-size print for your office, we've got you covered! NEXT: What's Your Brand's Personality?